and at times a rather fickle and snobby foodie at that. 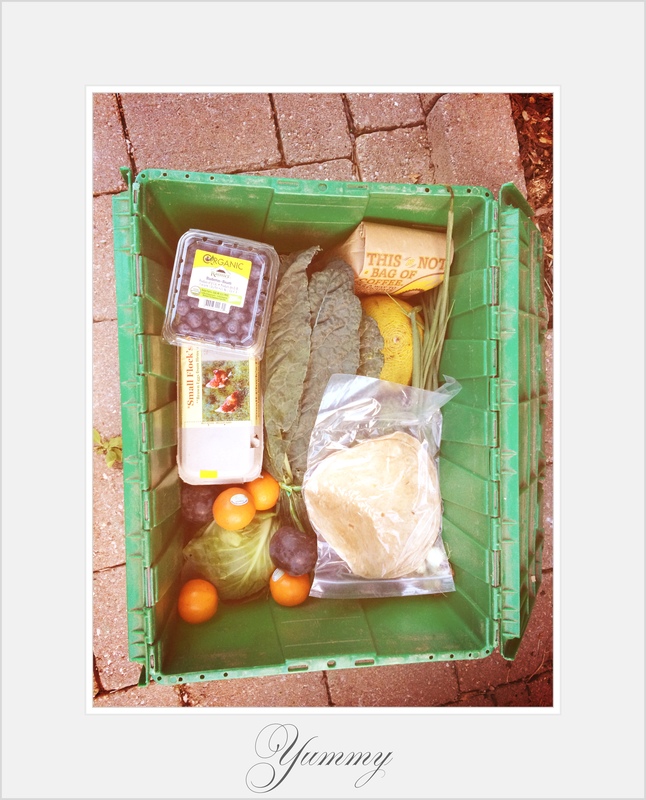 My latest summer endeavour involves a lovely box of organics delivered to a drop near my home. About two weeks ago after almost four years of hem-hawing around I found the time (a whole five minutes) to go online and order from Plan B Organic Farms. The idea of bringing my family organic food is an ideal for me but never something that I can and will do exclusively. I mean, who has the time or energy to do something that crazy? I may be a stay-at-home but with hubby often away, kids (furry and non) in seeming need of me 24/7, and when I add in my writing, reading and life in general, moi does not have a minute to spare. Did you notice I failed to mention housework? Me, too. So trekking and schlepping 10 kilometres for my favourite veggies at one store and then 15 kilometres in the other direction to gather the fruits made me crazy. And then there is the organic dairy for my princess, almond milk for the boy and meats at the other specialty stores that needs to bought…well, as you can see, there is little time to spare. I was losing so much time to just driving. 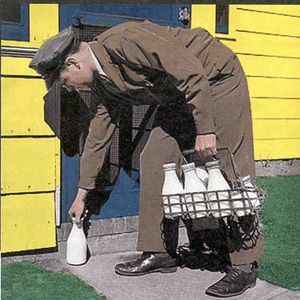 I began thinking back to my days growing up in Atlanta where we had milk delivered from Mathis Dairy. No worries, the photo below predates me but only by a bit. Delivery is the key word here. 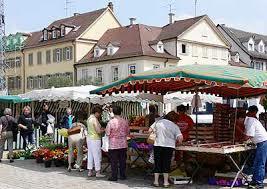 When I lived with my husband in Germany I went to the market in town three times a week and got what I needed from my local farmer, Eberhard Klotz. Local is the key word here. 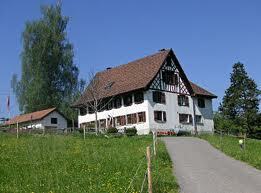 In Switzerland we could walk to the farm to get our basics. Of course, I never did walk there with the two kids but it sounds great, non? When we drove there even to get the amazing homemade ice cream, we also saw the pigs, chicks, bunnies and cows. The kids thought of it as an outing every time we went. Again, I am back at local. And then we moved to Canada. So much here is very convenient but the driving is another story. It is less than convenient to say the least. Four year later there were quite a few reasons for us to finally go (more) organic and take advantage of the local box of delivered organic produce. I would no longer be delivering myself to the produce. What else prompted us to choose the produce from Plan B? Supporting the local Ontario farmers also became increasingly important to us. I figured we would be less wasteful if our produce was delivered to us in smaller quantities and so far I have been right. And finally, I needed to be challenged. 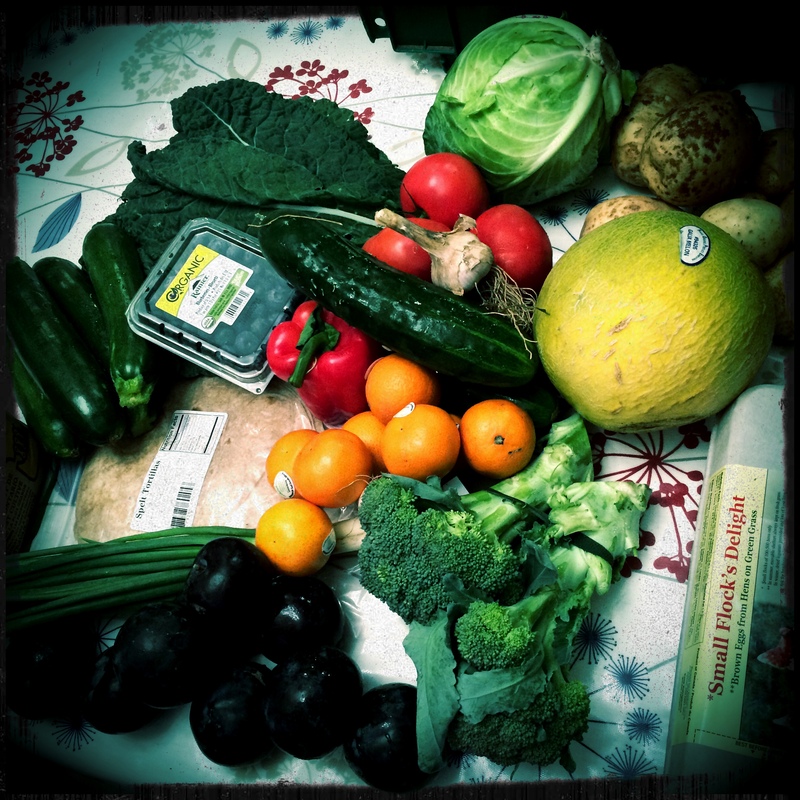 I found myself in a rut as many people do when buying the same produce week in and week out. Having the co-op determine what I will get, I am forced to think outside of the box – so to speak. I love is cooking with ingredients that are both local and seasonal. Now, I may not be singing the same tune come January when I will have loads of root vegetables every … single … week. In fact, I might well be losing my mind. Then again I might be losing my mind at that time for other reasons such as the ridiculously cold weather. Who knows? One kale, one cabbage, one broccoli, eight potatoes, four zucchini, one pepper, one bunch of spring onions, one garlic, blueberries, six plums, six mandarins, along with some eggs, coffee and the most delicious spelt wraps ever. Honestly, the wraps were the best we have ever eaten and so I doubled the order for week two. And look at the eggs. 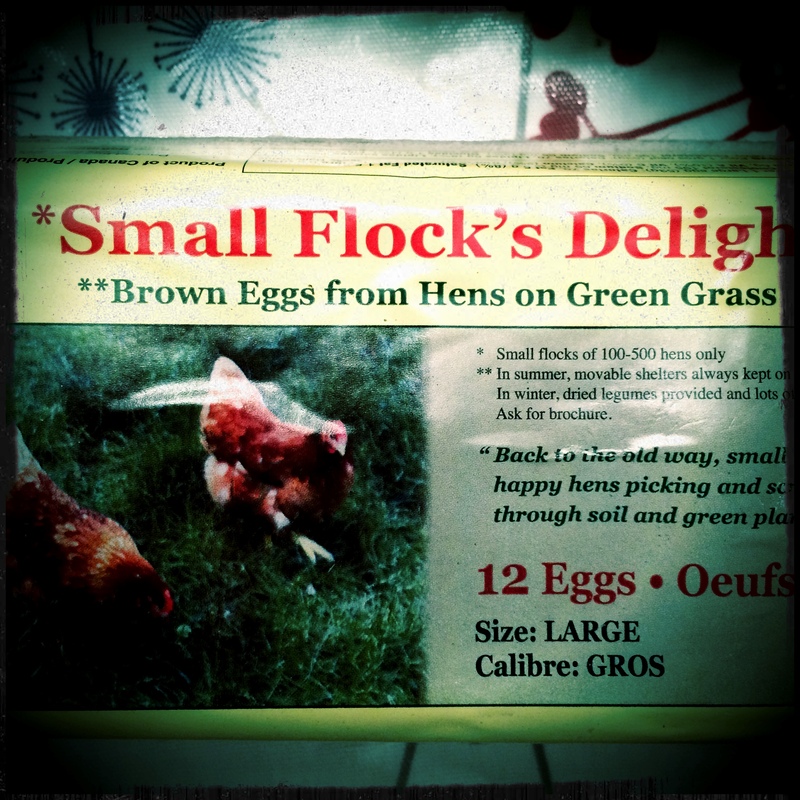 I love the name: “Small Flock’s Delight”. Two deliveries later, we are still thrilled. This week we received a lovely little watermelon which my kids gobbled up seeds and all within a day. The beans are almost gone as well as the little carrots. I can not ask for anything more. I also recently signed up for Plan B and feel the way you do. I love it. I’m also a stay at home mom and I opted for the home delivery option. With 3 small kids it’s difficult to drag them out to the grocery store as it is. This way I can stay at home and just answer my front door to fresh, organic vegetables. To add to my love of organic and natural foods and supporting Ontario farmers, we also did the same with our meat and we bought all our meat and fish from Nutrafarms! If you haven’t already please check it out. Honestly it’s the best thing I’ve ever done for my pocket book and my family. I cannot believe that everyone who has these options open to them doesn’t live this way. I am so happy I am not the only one feeling the way I do about Plan B. It is a fantastic service. 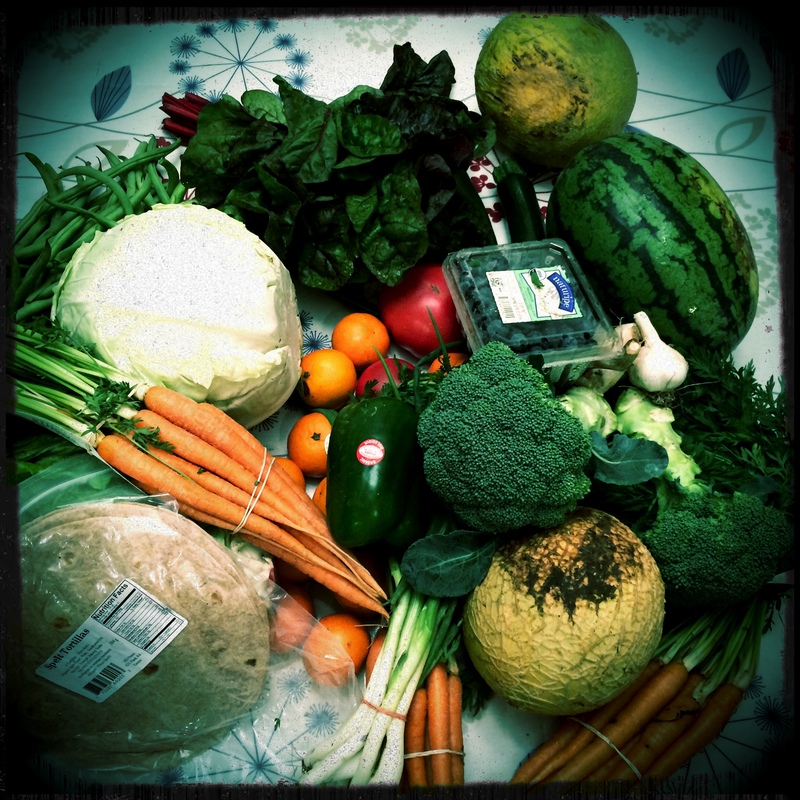 Thanks for the tips about Nutrafarms…I will totally check them out! This week we opened the box and saw summer squash. My daughter was thrilled and I must be honest, I was thrilled that she was thrilled about squash! So you have your produce delivered? I am thinking about doing that when it gets colder 🙂 I am sure it really is even better than me going to the drop even though the drop is five minutes away. Do you have a favourite recipe for the green beans we have been getting? I just tried this recipe for Balsamic Green Bean salad and it was yummy even though I omitted the feta. Maybe you will like it, too.